This year, my garden produced a TON of green beans! There is nothing like fresh beans picked from the vine. They’re perfect! With so many on hand, I began searching for new green bean recipes. 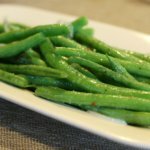 That’s when I stumbled upon this great recipe for Parmesan Roasted Green Beans on a great blog I found — Cooking Tip of the Day. Preheat the oven to 400 degrees. Place the green beans in a large bowl. Drizzle olive oil over the green beans. Sprinkle with salt and pepper. Toss the green beans to coat them evenly. 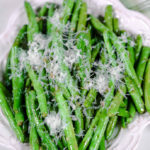 Sprinkle grated Parmesan cheese over the green beans. Toss again to coat the beans evenly with the Parmesan cheese. Lay the green beans in a single layer on a baking sheet. Bake for 15 minutes or until the cheese melts and the beans turn a light golden brown. The first time I made these, I made enough my husband and I (my son had eaten at his grandparent’s house that night). I had every intention of sharing these with Jim. I’m ashamed to admit, though, that he didn’t get any green beans that night. As soon as they came out of the oven, I tasted one. And then another. And then another….I think you get where this is going. Before I knew it, there were all gone. I can’t tell you how many times I’ve made this recipe this summer. We all love these beans. The only other thing I added to the recipe above was 1-2 cloves of minced garlic. Everything’s better with garlic in my book. I HIGHLY recommend making this recipe! In fact, what are you having for dinner tonight?!? Looking for more? 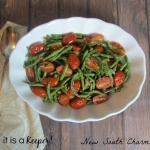 Check out all of the easy side dishes on It Is a Keeper. Thanks so much for linking up to THIS WEEK’S CRAVINGS “Everything GREEN”! Don’t forget to come back next Monday for Chocolate…Chocolate… and more Chocolate!!! Parmesan. Fresh green beans. What’s not to love????????? Thanks for sharing on Crock Pot Wednesday. I hope to see you back again this week. That sounds tasty! I love good green beans…I will have to try these. Thanks for linking up to Tip Day Thursday at Around My Family Table. Link up anytime! We love roasted vegetables here and I so know what you mean about snacking them all away. Thanks for putting this recipe in the Saturday Swap. i am a bit envious..something decided they really loved our green beans this year and we had only a handful to eat. 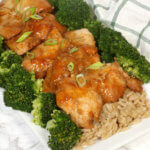 this recipe looks so good and so easy! i can’t wait to try it. thank you for linking up to tuesday night supper club! Simple and healthy and flavorful is the best! I love freshly grated parm on just about anything and these beans look tasty. Thanks for linking up with Friday Potluck this week! Wow! Thanks for posting what looks like an incredible recipe. I never would have thought to roast green beans but it makes perfect sense. I will definitely try this. This is a friday’s favorite for sure! Hi! 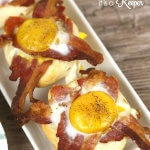 Thanks so much for linking up this great recipe to my party! Anything with Parmesan is right up my alley and you just can’t go wrong with this simple and delicious combination! I love Greenbeans!!! This one I have to try!